Krishna Hebbar was born in 1911 in Karnataka and received his diploma from the Sir J J School of Art in 1938. He taught art at the School from 1940 to 1945, later he went to Europe and decided to study art in Academy Julian in Paris. Among several important shows both in India and abroad, Hebbar had participated in international exhibitions like the Venice Biennale, the Sao Paulo Biennale and the Tokyo Biennale. He won the National Award in 1956 to be followed by awards in the annual exhibitions of 1957 and 1958. He was first exposed to an international audience in 1965 during the exhibition "Art Now in India", in London and Brussels. 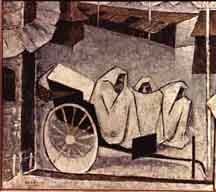 Hebbar had also received the Gold Medal of the Bombay Art Society in 1947. He was Chairman of the Lalit Kala Akademi in 1980 and President of the Bombay Art Society in 1990. The Padamshri was awarded to the veteran artist in 1961 and the Padma Bhushan in 1989. He died at the age of 85 in 1996. The Jehangir Art Gallery was funded by Sir Cowasji Jehangir at the urging of Hebbar and Homi Bhabha. He was also responsible for the founding of the Chemould Art Gallery. The K K Hebbar Art Foundation provides scholarships to six students every year, honors senior artists and organizes art camps.